Non-Muslim students were told to drink their own urine from the toilet by the assistant principal at a Malaysian school. A rights group has sent a letter of complaint to the school. 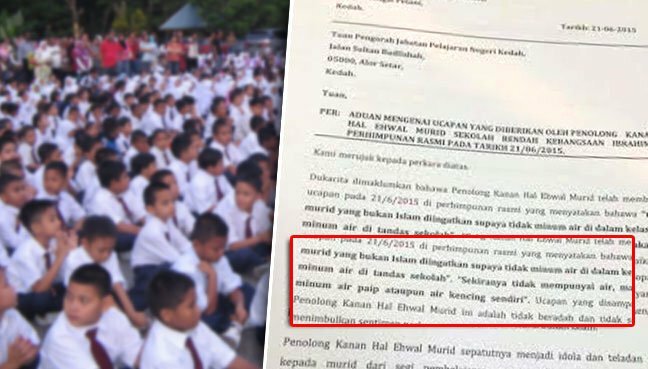 A group championing the interests of non-Muslim students (Waris Murid-Murid Bukan Islam) have lodged a complaint with the Kedah Education Director that a senior member of the teaching staff at the Sekolah Rendah Kebangsaan Ibrahim directed them to drink water only in the toilet. This same person was also alleged to have said that in the event they had not brought any water with them to school, they could drink water from the tap there, or “drink their own urine”. These instructions were allegedly given by the assistant principal, who is also responsible for student affairs, during the school assembly on June 21. The errant teacher did not mention the fasting month during the brief speech. The letter of complaint went on to berate the errant teacher for setting a bad example and having no respect for non-Muslims, both students and teachers, and for harbouring racist attitudes.